CHICAGO--(BUSINESS WIRE)-- Hyatt Hotels Corporation (NYSE: H) and Commonwealth Hotel Collection (CHC) announced today the opening of Hyatt Regency Aurora-Denver Conference Center. 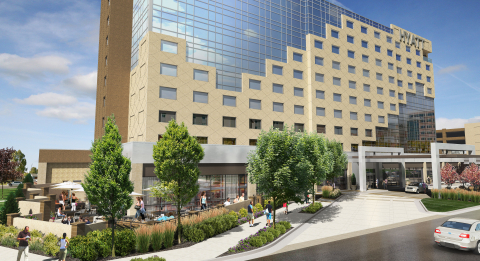 Located in Denver’s rapidly developing neighboring city of Aurora, the hotel serves the adjacent University of Colorado Anschutz Medical Campus, a hub for medical research and development, meeting the demand for accommodations, dining and meeting space. Additionally, the hotel’s proximity to Denver International Airport and the new Regional Transportation District (RTD) Light Rail line creates a central meeting location for both local and traveling conference attendees. Hyatt Regency Aurora-Denver Conference Center features 249 non-smoking guestrooms and suite accommodations, including 195 luxurious deluxe rooms with king beds, 49 spacious deluxe rooms with two queen beds, four beautiful grand suites, and one presidential suite. All accommodations offer complimentary Wi-Fi, 55-inch flat screen televisions, individual climate control, and access to various amenities and services to make stays more seamless and enjoyable. Offering unprecedented meeting and event space, customers have access to more than 36,000 square feet to plan for their needs. Hyatt Regency Aurora-Denver Conference Center offers 15 meeting rooms, including 20,000 square feet of traditional meeting space, an 11,750 square foot Grand Ballroom and 8,100 square feet of meeting space that holds the elite accreditation from the International Association of Conference Centers (IACC). Approximately 4,000 square feet of outdoor terrace space is also available. Additionally, the hotel provides among the best catering services available in the metropolitan area, boasting an experienced staff equipped with the knowledge to provide exceptional quality and incredible service for any size or type of event. The hotel’s highly anticipated restaurant, Borealis, reflects a number of different culinary styles and influences. Guests can embark on a culinary journey with the hotel’s award winning chef, Tim Freeman, who regularly incorporates fresh, local Colorado flavors with Asian and Middle Eastern influences. The relaxed and inviting fine-dining atmosphere allows guests to unwind with a cocktail or craft beer in the lounge or enjoy the fresh air on the hotel’s large terrace. The wellness facilities at Hyatt Regency Aurora-Denver Conference Center include an oversized fitness center with the latest high-tech cardio and strength training equipment, a hot tub, and an outdoor swimming pool with sun deck. For more information about the hotel and conference center, visit aurora.regency.hyatt.com or call (720) 859-8000.